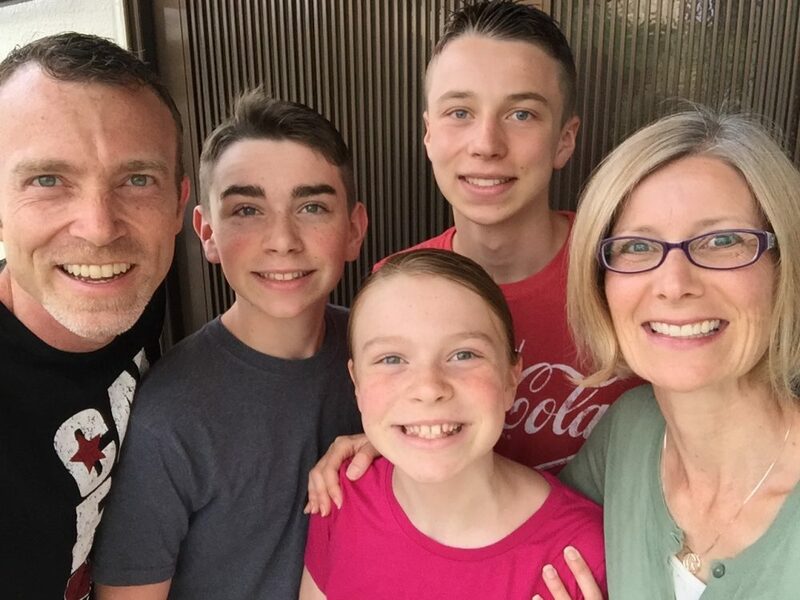 In addition to multiple trips to the swimming pool and relaxed time with friends, the kids and I have taken some time this summer to learn more about corn and bean plants. 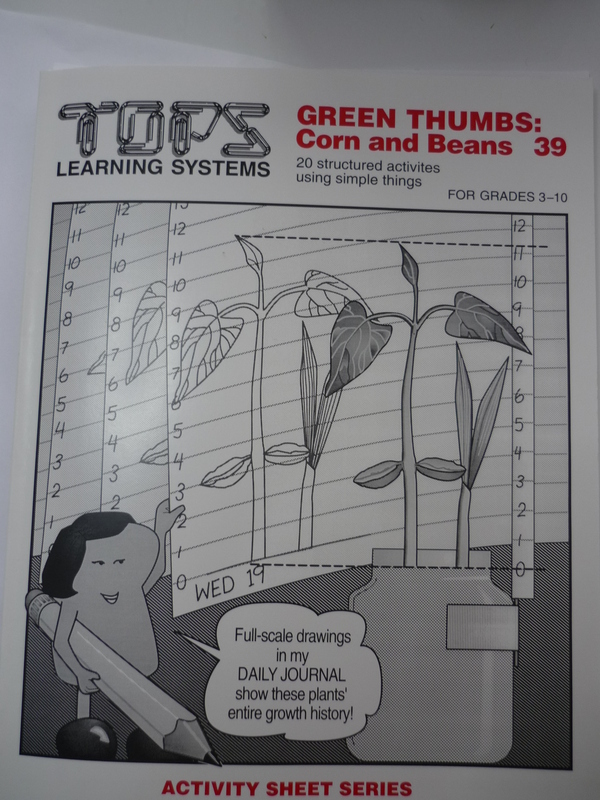 Following the TOPS Corn and Beans experiment book, which came with our Sonlight science curriculum, we had a great time experimenting and observing our plants. 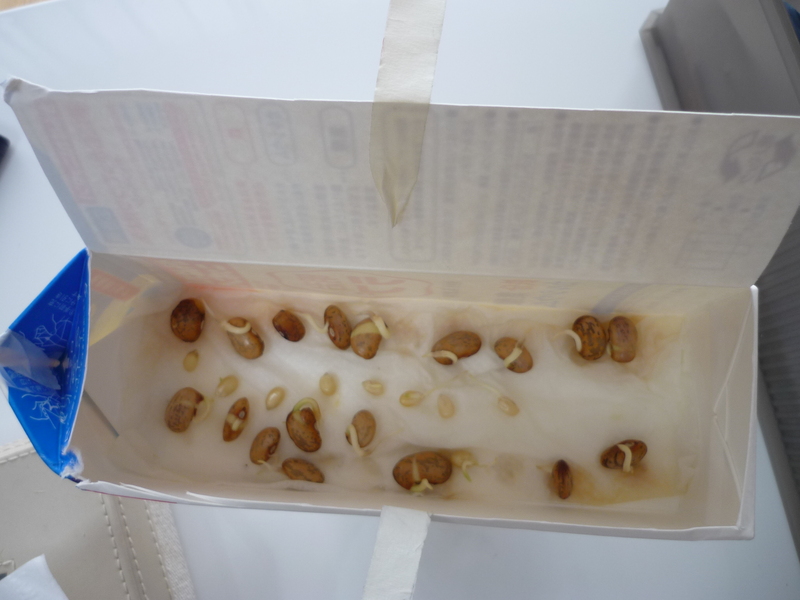 Just like when we studied radishes with a TOPS textbook, the kids made a self-watering greenhouse out of a milk carton for sprouting and growing their seeds. 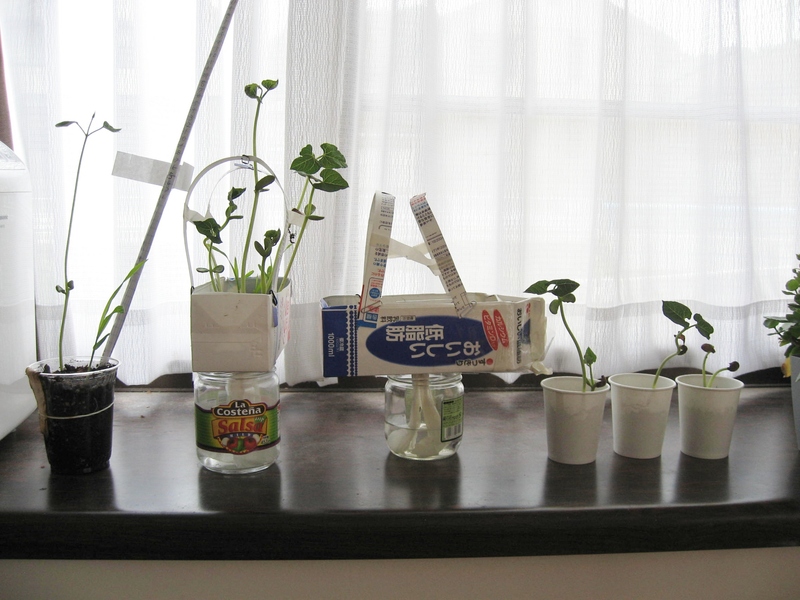 And this time they also made a simple balance for weighing changes of mass in their sprouts as well as a measuring stick for keeping track of plant growth. 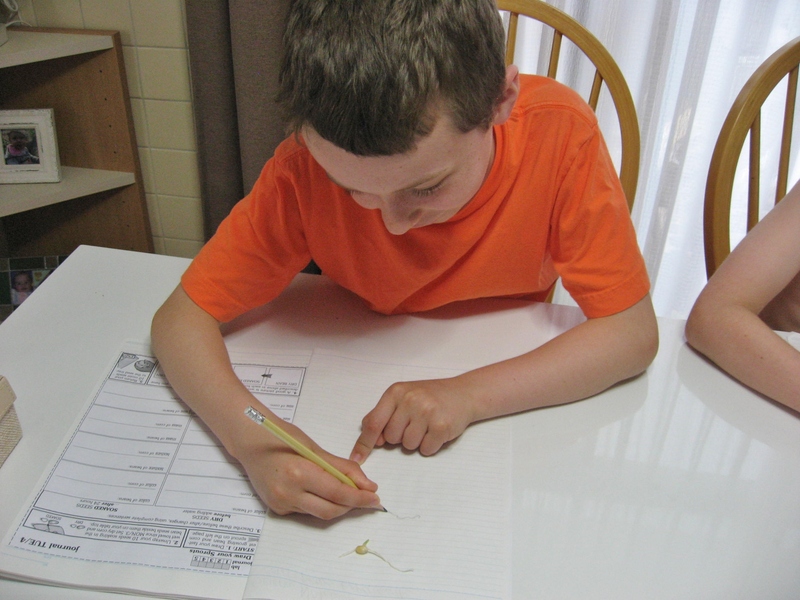 For a month, the kids observed their seedlings, made detailed notes and drawings in their journals, and then graphed their results. 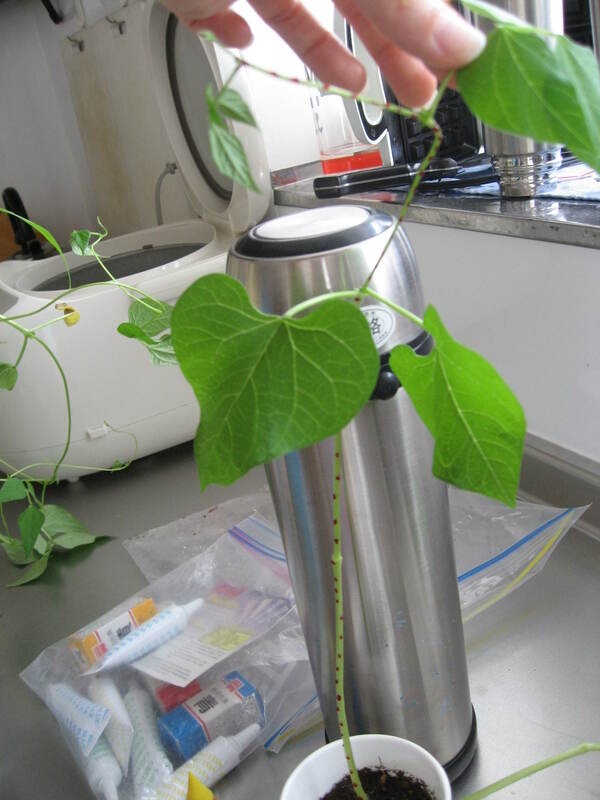 They also made predictions about what would happen to the plants in different conditions, such as if a leaf were covered with foil or vaseline, or if the cotyledons of a bean plant were removed prematurely. 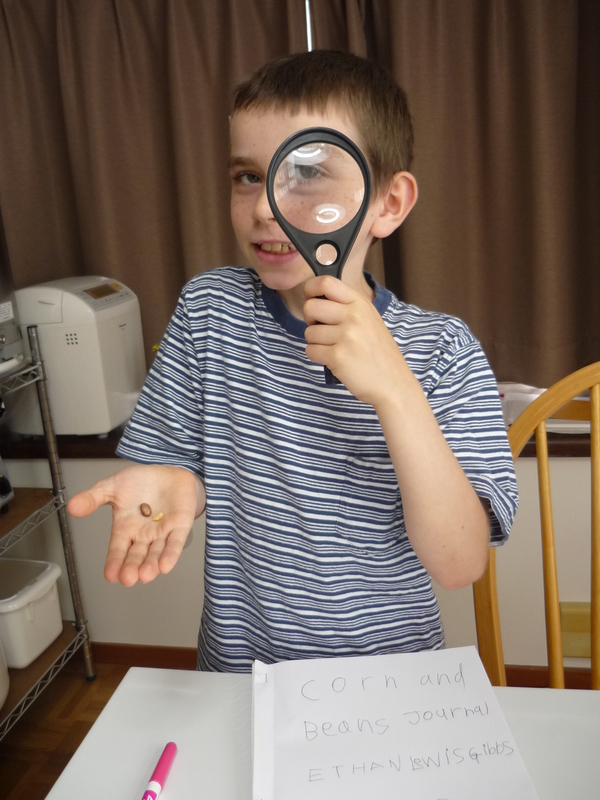 We also became more knowledgeable about the names and functions of the various parts of the plants and learned how to tell whether a plant is a dicot or a monocot by looking at the shape of the leaves. All in all, we pretty much felt like corn and bean experts at the end of the month, though there is still much more we could learn. 🙂 Here are a few shots of the kids enjoying their research project. 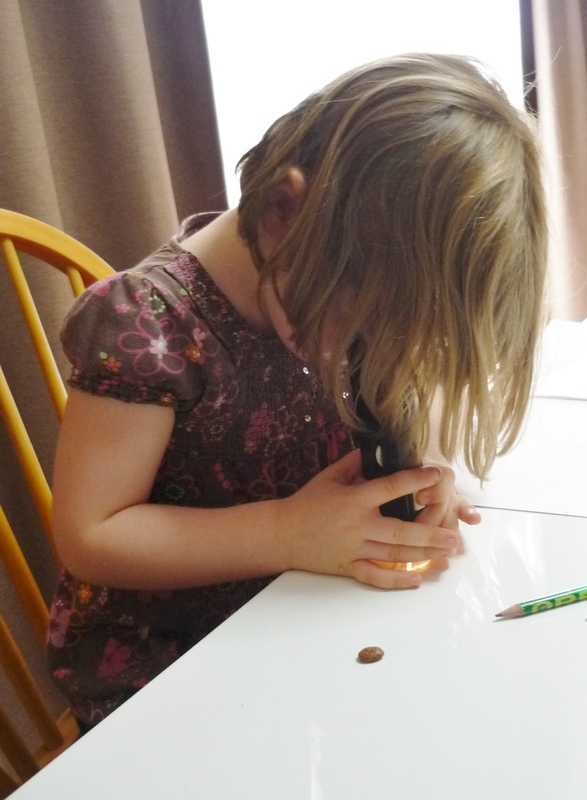 Katie examined some of the seeds with a hand-held microscope. 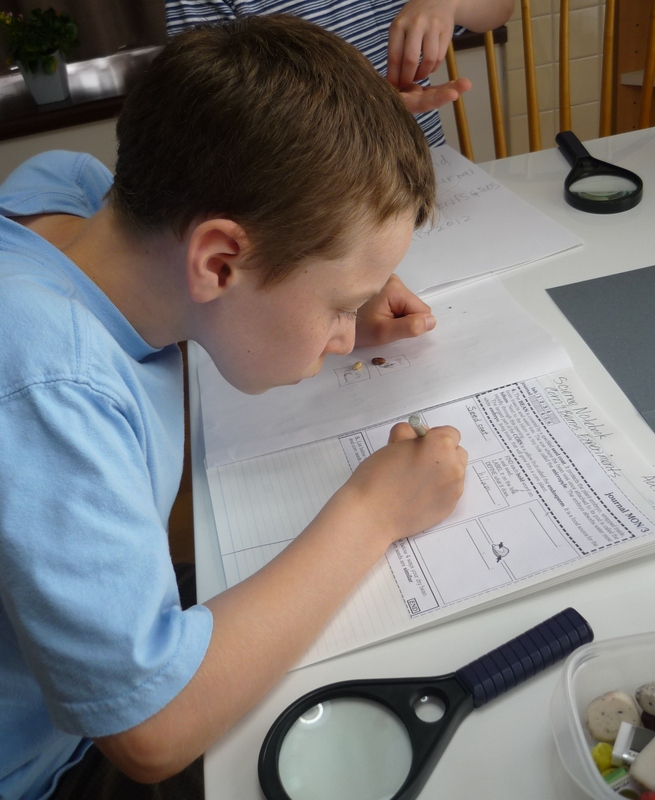 Austin making detailed drawings of his seedlings. 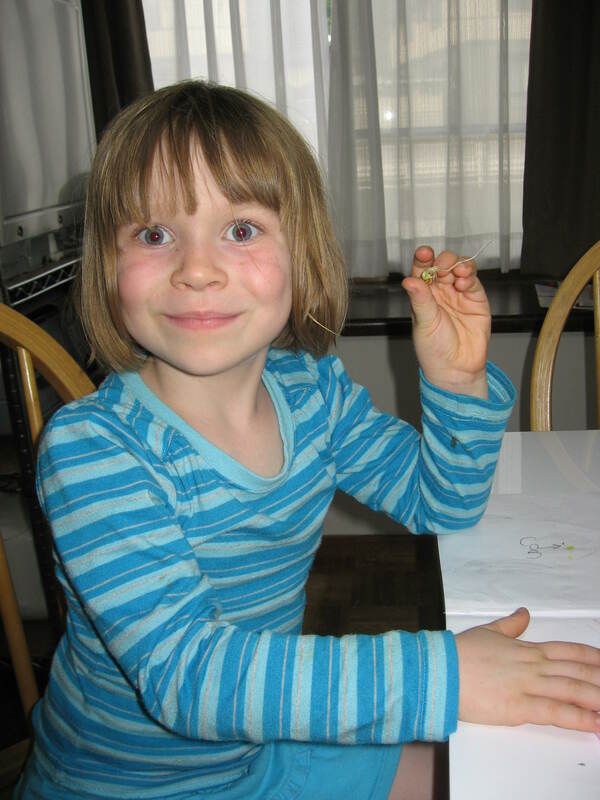 Katie joined in quite a few of our corn and bean activities. Our plants growing in the kitchen window. 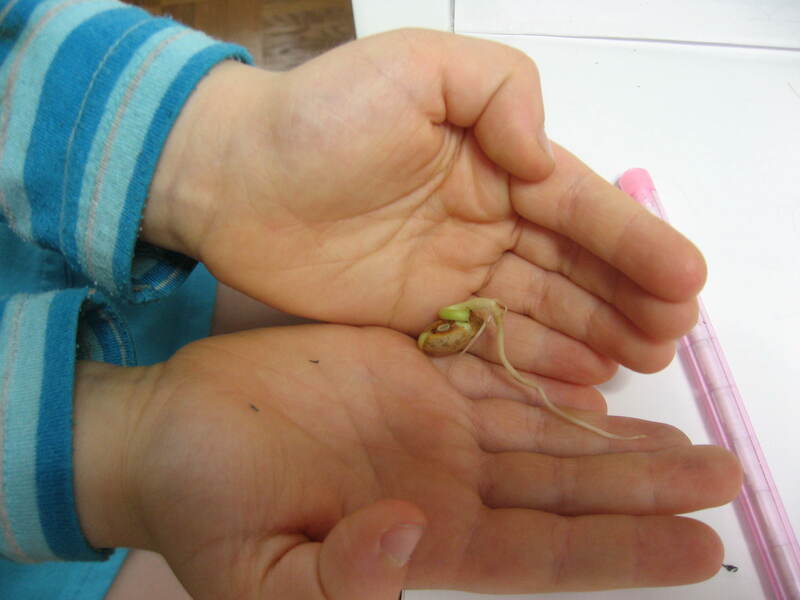 We put food coloring dots on some of our plants to find out how they grow. 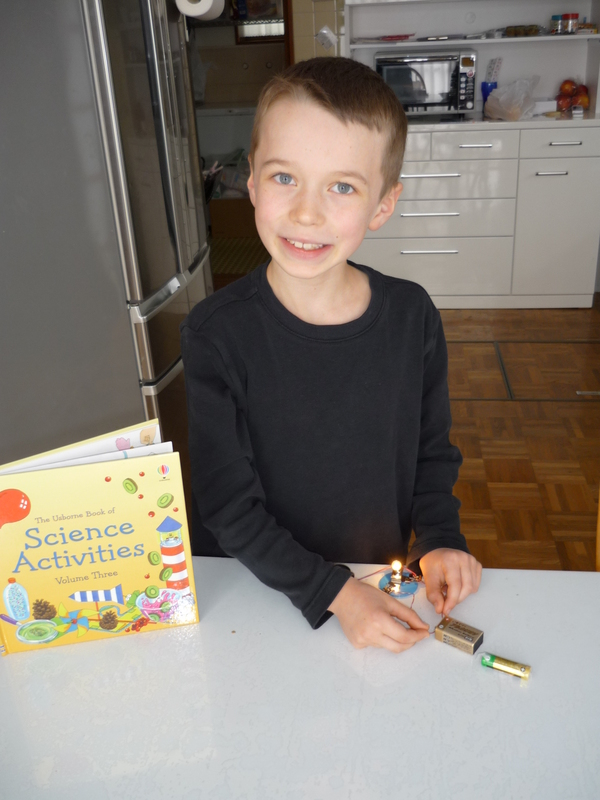 One thing that we really love about our Sonlight science curriculum is all the great hands-on activities and experiments the kids get to do throughout the year. 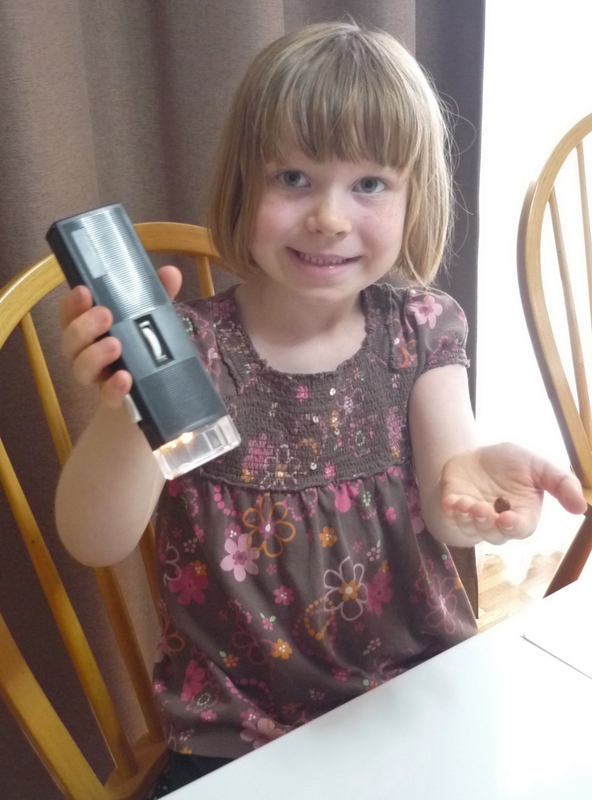 This year we have done several activies with magnets and electricity that the boys (and even Katie) have gotten really excited about. 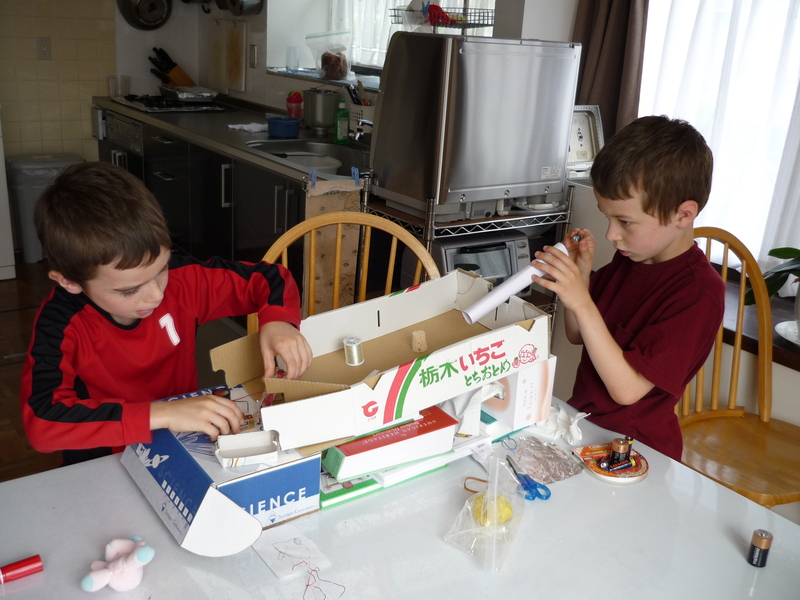 One activity the boys did was to make a buzzer game from a cardboard box, some spools of thread, and a buzzer they hooked up to batteries with wires. 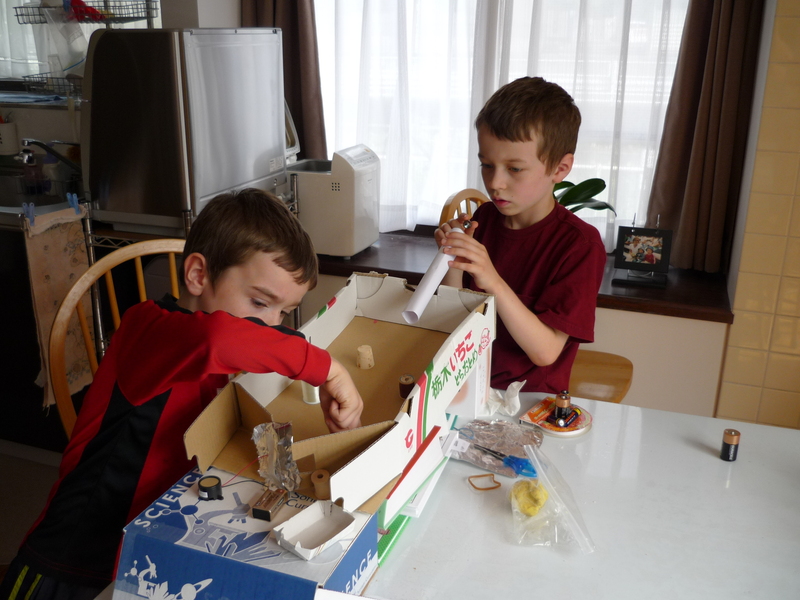 It took quite a bit of adjusting and readjusting to make the game work, but they were finally able to make the buzzer go off after the marble went through the “obstacle course” of spools and then plunked down onto foil squares attached to the two wires of the buzzer to complete the electric circuit. 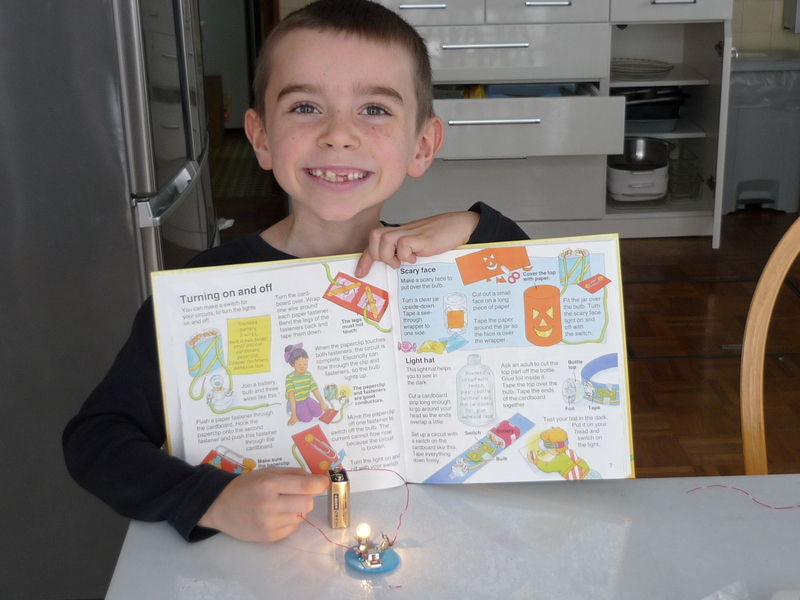 They also learned how to light up a small lightbulb by completing an electric circuit. 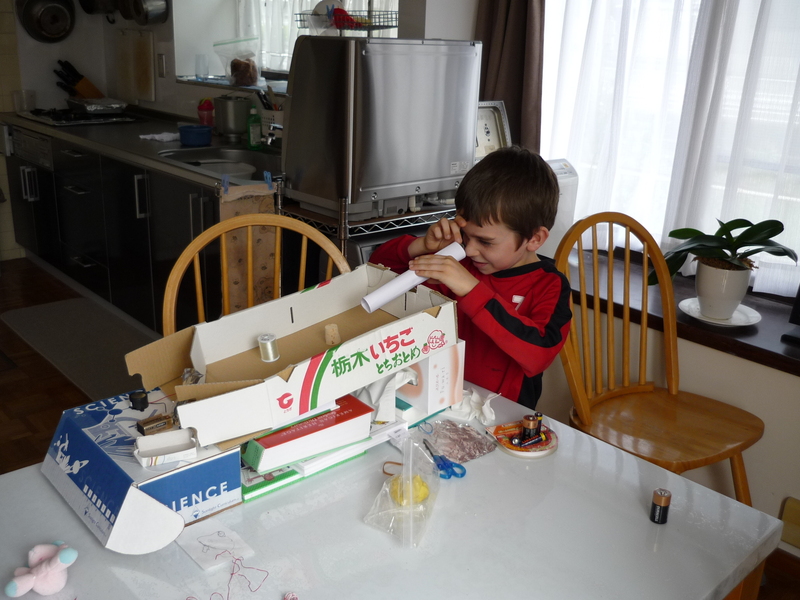 Here are a few photos of my budding electrical engineers. 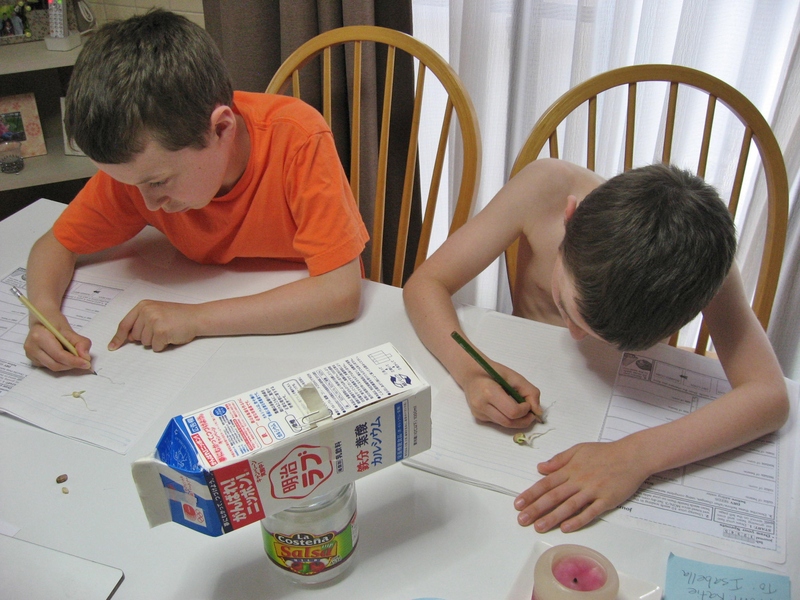 A couple of days ago, the boys and I completed the last science experiment in our homeschool curriculum for the school year. 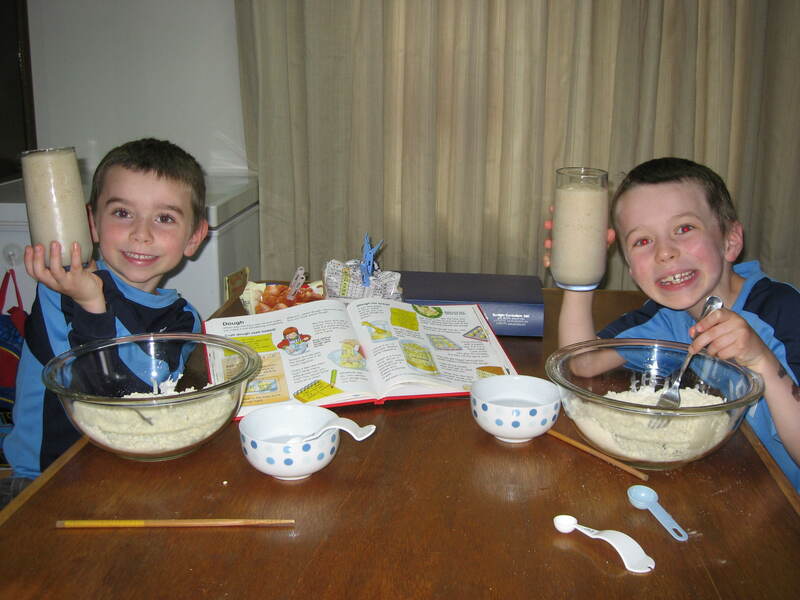 The boys were sad because they have totally loved our Sonlight science books and experiments. 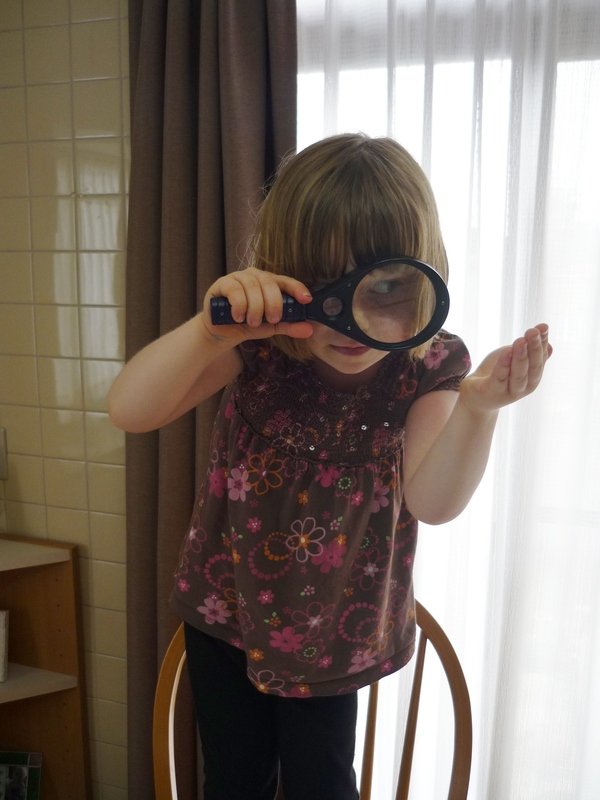 We grew bean plants, put several different substances in the freezer to see which ones would freeze, watched a butterfly hatch, made a model volcano, and did a bunch of other really fun age-appropriate science activities together. 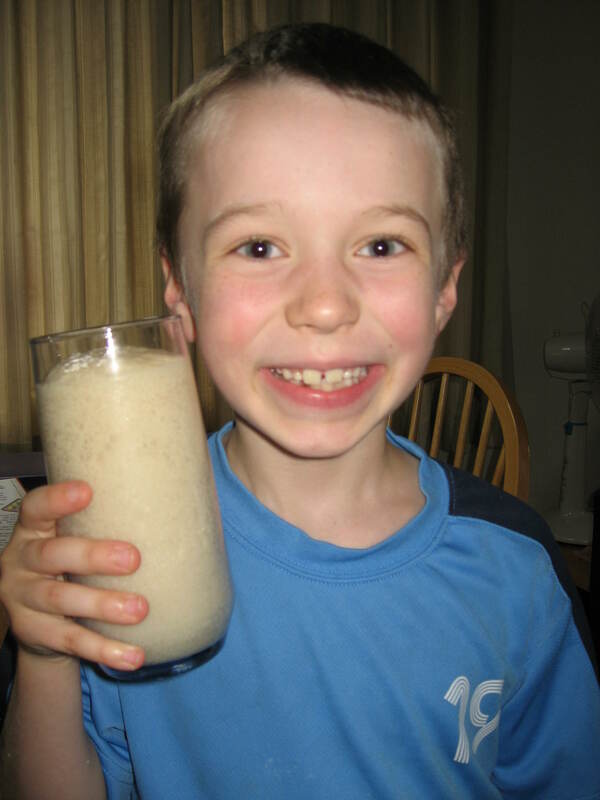 This last activity involved learning about dry yeast and what happens when you add sugar and water to it. 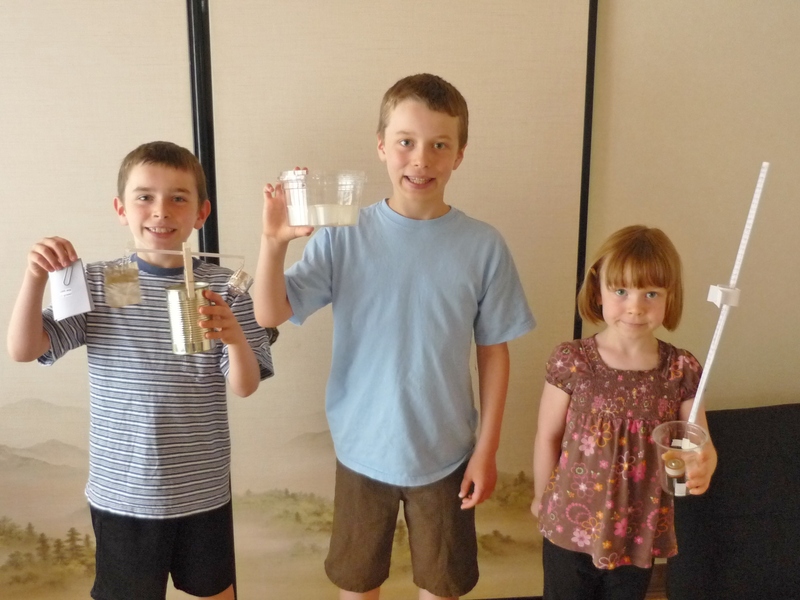 We learned that the water activates the yeast, which eats the sugar and then secretes gas as a product of digestion. That’s what makes the yeast solution get all bubbly and it’s also what makes bread dough rise and what causes bread to have little air pockets in it. 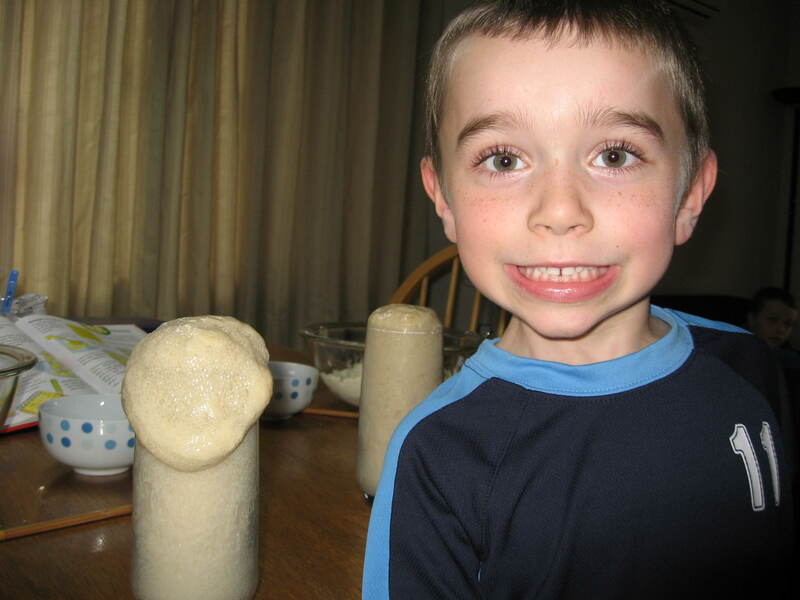 After we got to see the yeast mixture get super bubbly and even start to overflow a tall glass, the boys used it to make their own yeast rolls and then baked them in the oven. 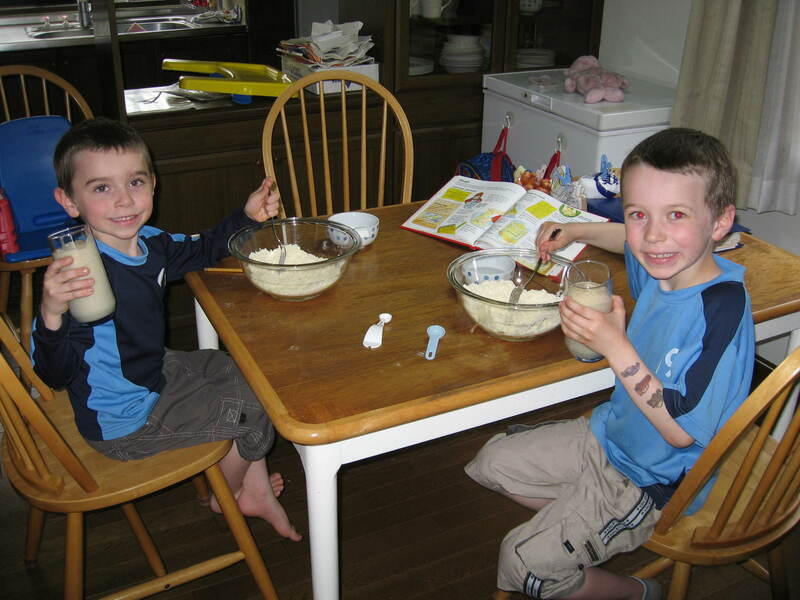 Of course, one of their favorite parts was getting to eat the results! 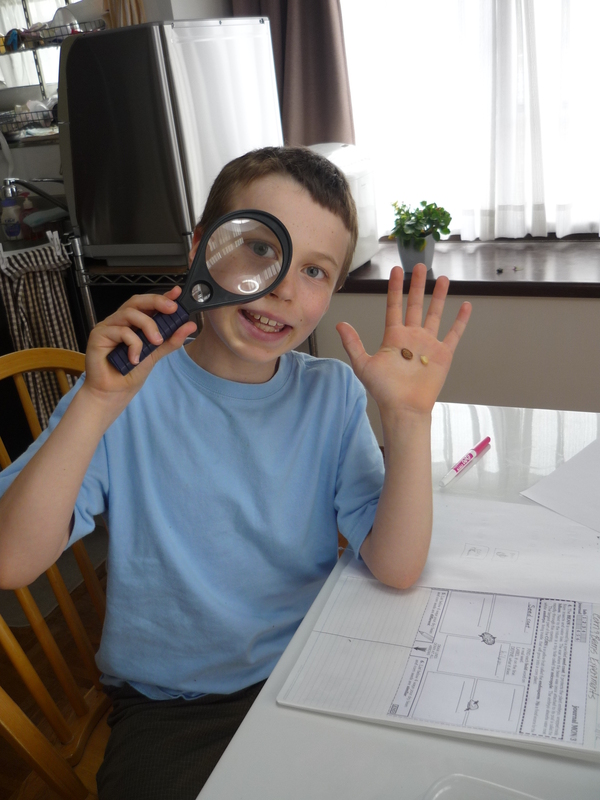 Here are some photos from our science activity. 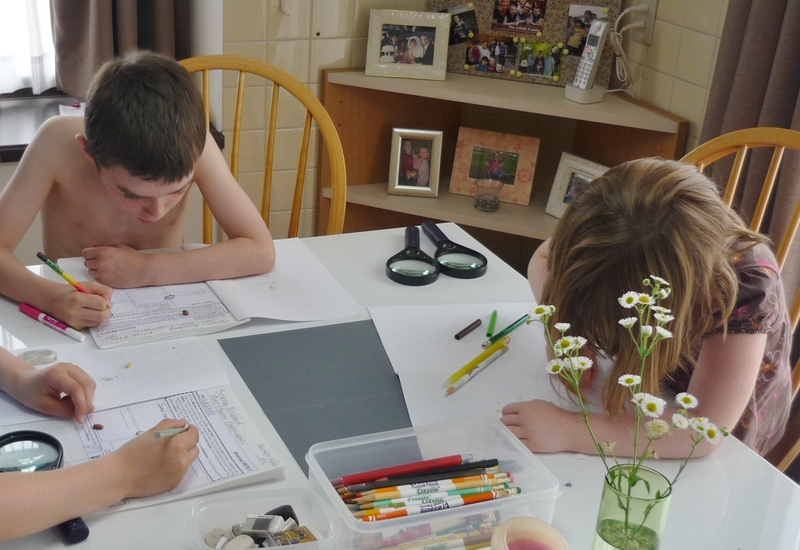 We did almost all of our science experiments at the kitchen table. 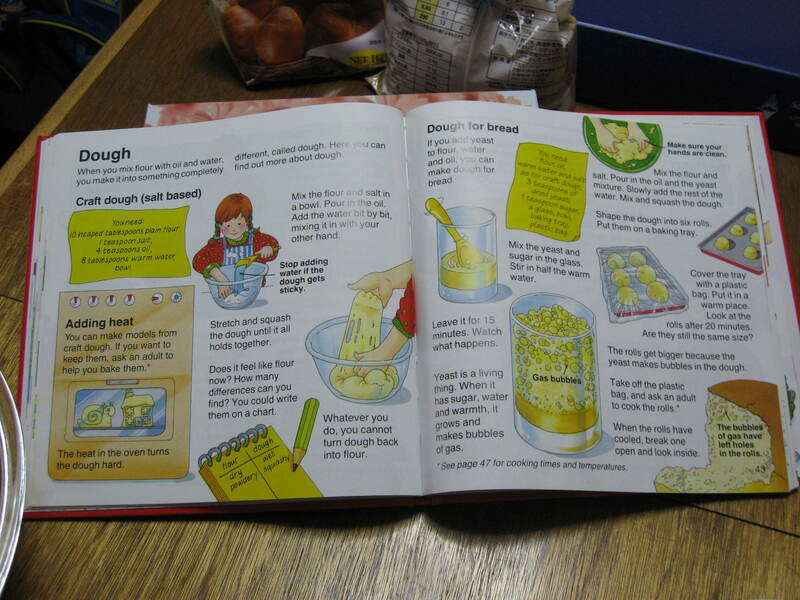 Looking excited about getting to make bread. 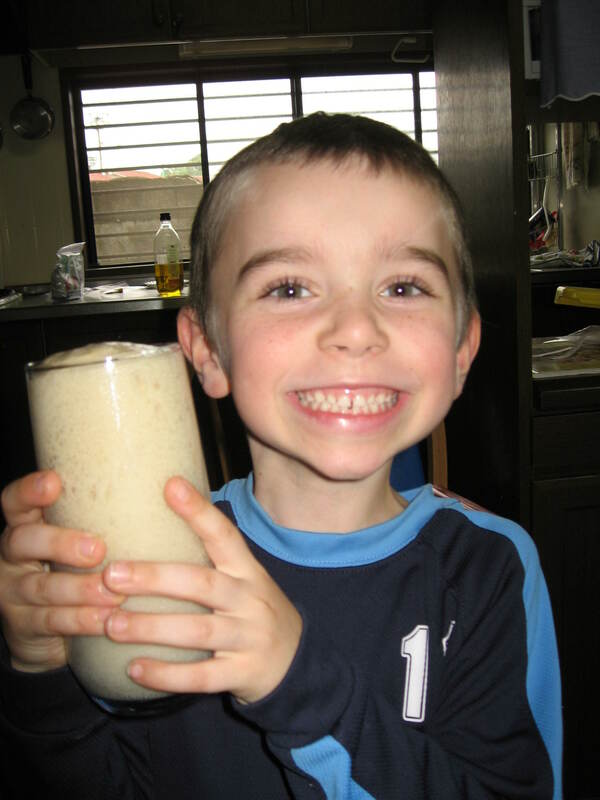 Ethan proudly poses with his glass full of yeast mixture. It looks like a tall milkshake! 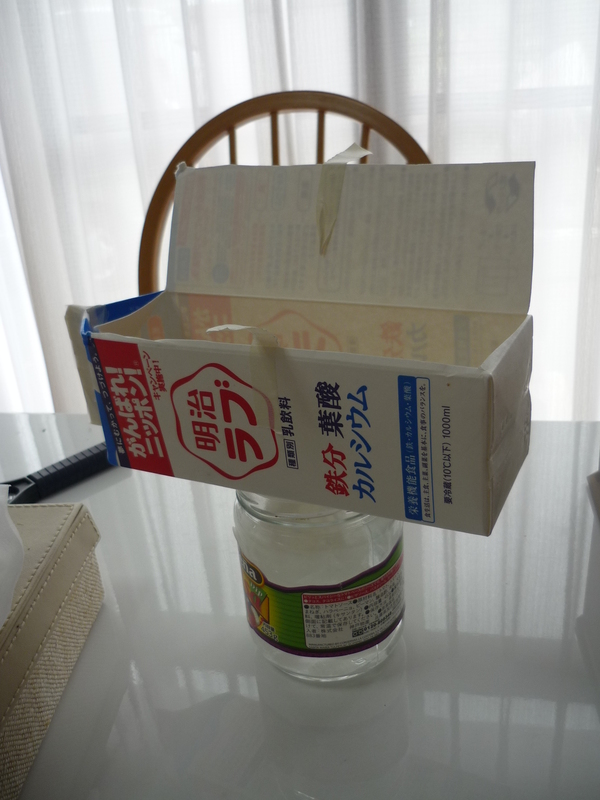 The book of science experiments we used this school year.